In 1897, Gopalrao Gund proposed holding in Urus as in expression of his gratitude to Baba for having been granted the birth of a son after many childless years. Baba gave HIS permission for the celebration and fixed the day for Ramnavami. This was an ingenious touch of Baba’s. Urus is a Muslim festival honoring a Muslim Saint( usually one who passed away); by holding the Urus, on the day of a Hindu festival, the two communities were brought closer tighter in a natural yet remarkable way. Things were going on in this way and the fair was gradually increasing in importance till 1912. When a change took place. That year one devotee Mr. Krishnarao Jogeshwar Bhishm came to the fair, he was staying in Dixit Wada. A new thought arose in his mind and he costed a letter thus. 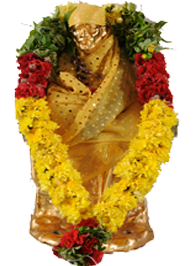 There is some provindential arrangement in the fact that the Urus or fair is celebrated in Shirdi on the Ram Navami day. The Ram Navami day is very dear to all the Hindus then why not begin the Ram Navami festival the celebration of the birth of Shri Ram on this day here. Kaka Mahajani liked the idea and it was arranged to get Baba’s permission in this matter. Bhishm solved the difficulty of Kirtan by saying that his Ram Akhyan, the composition on Rama’s birth was ready and he would do the Kirtan himself while Kaka Mahajani should play on the harmonium. It was also arranged to get ‘ Sunthawada’ (ginger powder mixed with sugar) as Prasad prepared by Radhakrishnamai. So they went to masjid to get Baba’s permission Bhishma explained the idea of celebrating Ram Navami festival and asked for Baba’s permission and Baba gladly gave it. All rejoiced and made preparations for the Jayanti festival. Next day the masjid was decorated. A cradle was supllied by Radhakrishnamai and placed in front of Baba’s seat and the proceeding stated Bhishma stood up for Kirtan and Mahajani played on the Harmonium. Baba took a garland form the ‘Nimber’ and placed it round his neck and sent another for Bhishma. Then the Kirtan commenced. That day’s programme including Mahapuja and Arti was Finished. Later on Mr. Mahajani asked Baba for permission to remove the cradle. Baba refused the same saying that the festival was not yet finished. Next day another Kirtan and Gopalkala ceremony was performed and then Baba allowed the cradle to be removed. While the Ram-Navami Festival was thus going on, the procession of the two flags by day and that of the sandal by night, went off with the usual pomp and show. From this time onwards the Urus of Baba was transformed into the Ram Navami Festival and began to grow gradually year by year, Radhakrishnamai started Naam-saptah. ‘Shirdi’ looked like a behive of men. It is to be noted that both the Hindus and Mohammedans have been working together in both the procession during the entire festival and there has been no confrontations or quarrel between them at all so far. In Shirdi, two locally historic rituals are carried out during this festival: the sack of wheat that is kept in Dwarkamai is changed and the old one taken to prasadalaya to be used there, and secondly, the dwarkamai flags are replaced. When Urus was first celebrated, Gopalrao Gund prevailed upon his friend to supply a flag for the procession. This was Damu Anna Rasne of Ahmednagar who had similarly been blessed by Sai Baba with Son’s having come to Baba for this Purpose on the recommendation of Shama’s father – in – law. In addition, Gund asked Nanasaheb Nimonkar to supply a second flag with embroidery. This was also done and both flags (described as “huge” by M. W. Pradhan, who saw them) were taken in procession through the village and fixed at the two corners of Dwarkamai. Descendants of these two devotees continue this tradition and flags are brought and offered at Baba’s Samadhi before being taken on a grand procession.